It may be the first day of summer in the real world, but winter has come to Westeros in the form of a brand new trailer for Game of Thrones’ penultimate season. It’s jam-packed with footage that lines up with all the rumours we’ve been hearing about the show over the last year, so let’s break it all down to see what secrets we can uncover. The trailer opens with Sansa taking a walk through the snowy Godswood at Winterfell. Over it, we hear Littlefinger give a little speech—presumably to Sansa before this scene, telling her to be ready for any battle, be it in the North, the South, everywhere and anywhere, “in your mind.” To the surprise of no one at this point, Littlefinger has some trust issues! The gate leading from beyond the wall to Castle Black raises, allowing Bran and Meera to pass through. The way the trailer is cut makes it seem like Jon sees them, but considering he’s wearing Wildling clothing, this appears to be different footage from Snow’s trip back beyond the Wall, which we see multiple times in this trailer. 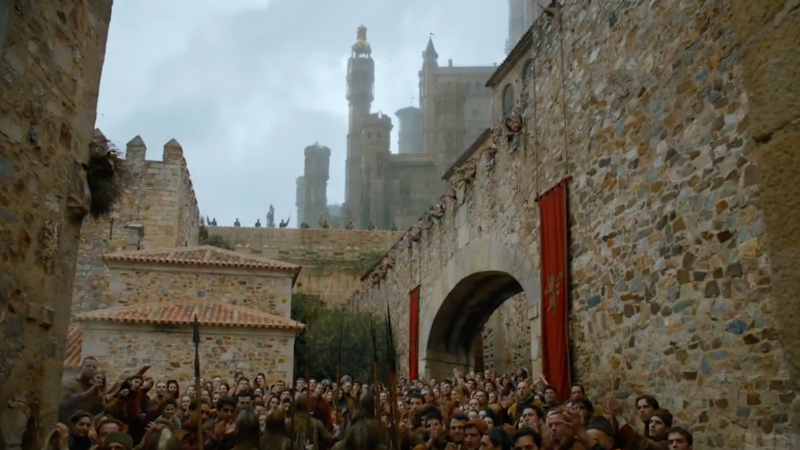 Goldcloaks march through the streets of King’s Landing to a surprisingly jubilant crowd. It’s hard to tell, but we’ve heard reports that as part of his new alliance with Cersei Lannister, Euron Greyjoy drags a captive Yara Greyjoy (taken in the big battle between Dany’s host and the Lannister forces, also seen throughout this trailer), Ellaria Sand, and Tyene Sand through King’s Landing, which would match up with this sequence. The shores of Dragonstone play host to some new arrivals. It’s hard to tell just who, but there’s been set pictures of both Jon Snow and his retinue and Gendry—who’s making a long-awaited return this season after years of rowing in circles—landing on these beaches. It might not even be either of those moments, and could be Dany making first landing. Although that seems unlikely, as this could be Dany’s first arrival on the shores of her former home, and it’s in very different lighting. This is definitely Dragonstone either way, given the rock formations. Dany tears down the Baratheon banners hung up in Dragonstone by its former occupant, Stannis, while Jon Snow intones, “For centuries our families fought together, against their common enemy. Despite their differences, together. We need to do the same if we’re going to survive.” The way this is laid over footage of Dany specifically could mean it’s taken from the long-awaited meeting between Jon and Daenerys we know is coming, but odds are Jon could also be discussing this with the houses of the North, or even the Wildlings beyond the Wall. Dany’s dragons fly toward Dragonstone, but below them on the beach it looks like there might be a few people there below. This seems to be cut from a shot we saw in the prior trailer, of Tyrion watching the dragons take flight from the cliffs around Dragonstone. 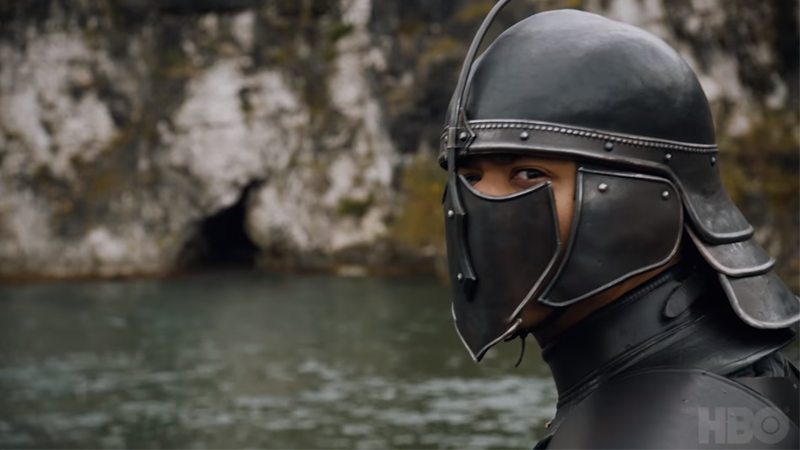 This shot of Grey Worm is interesting; you’re meant to think that it’s him sailing towards Dragonstone, but the rock formations are very different—and the crevice behind him is almost certainly what Grey Worm and whoever he is with (he nods at them slowly in the full shot) are sailing toward. Given there’s been rumours that Dany’s Unsullied attack Casterly Rock, the ancestral home of House Lannister, which is appearing for the first time this season—as well as the fact that in the books Casterly Rock is built upon a labyrinth of corridors built within the rock itself—could this be the Unsullied finding themselves an entry point to the legendarily impossible-to-besiege castle? After all, Tyrion has noted that in his younger years Tywin put him in charge of the drainage systems at Casterly Rock. If he knows a sneaky way in through those underground passages, as Daenerys’ Hand he’d tell the Unsullied. It’s Brienne and Podrick! 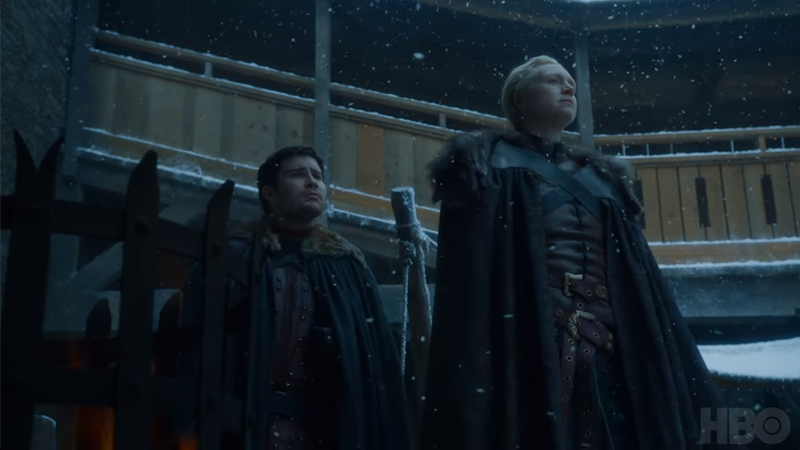 Interesting to note that Brienne is out of the armour gifted to her by Jaime (we saw her wearing it to beat the snot out of poor Pod in a behind-the-scenes video earlier today), and is instead wearing some decidedly Northern leathers. It’s hard to tell just where they are—the ramparts behind them don’t match either Winterfell or Castle Black. Nestled between shots of utter carnage as the Unsullied and Lannister forces battle it out in one of the biggest setpieces of the new season, a skirmish between Dany’s forces and a caravan of Lannister troops lead by Jaime Lannister—allegedly returning from having taken House Tyrell’s stronghold, Highgarden, which is also making its debut this season. It includes a very interesting shot of Sandor Clegane, wearing the thick furs of the Wildlings. Is he a part of the group Jon takes beyond the Wall with him? Is a Hound/Arya reunion on the cards, if Clegane is hanging around with Jon now? A swarm of ravens flies over a huge crowd of wildlings... and gets the attention of the Night’s King himself. The trailer seems to show him cutting Bran’s connections to the animals, but the interesting shot here is that Bran is in an old-timey wheelchair contraption, in front of a weirwood tree. It’s not any old tree, either: The location matches the tree Jon, Sam, and other Night’s Watch inductees took their oaths in front of all the way back in season one, so this should take place after Bran’s arrival at Castle Black. Just who he’s with, whoever, is unknown, so speculate wildly in the comments. Who among the Night’s Watch has a bald spot? Here’s the money shot of the trailer, and one of the most intriguing shots int he whole thing. Beric Goddamn Dondarrion is back, and he’s brought his light-up sword tricks with him. For those who don’t remember, Beric was the leader of the Brotherhood Without Banners, a roving band of mercenaries in the Riverlands, and also a follower of the Lord of Light, having been resurrected by Thoros of Myr and Red God magic multiple times. Why he’s returned now is unknown, but once again, take note of the costume: He’s wearing thick and heavy furs, indicating Beric has also gone beyond the Wall. Whether he was there before Jon’s sojourn or came up with him remains to be seen. Ships bearing the Kraken of House Greyjoy sail toward King’s Landing. Chances are these are Euron’s ships rather than Yara and Theon’s, given we know Euron will ally himself with Cersei this season. The Unsullied open up a gate to... let even more Unsullied in. If we’re right about that earlier shot of Grey Worm being from a group of Unsullied sneaking their way into Casterly Rock, this could be the fruit of their labour—getting inside the fortifications to open it up for a larger host waiting outside. We do get a brief shot of the Unsullied immediately charging into some unsuspecting Lannister soldiers, so it appears to match up with our theory. ...Dany, taking to the field atop Drogon. We’ve seen pictures and behind-the-scenes tidbits of the destruction she and Drogon unleash in this battle already, but this trailer has our best look so far at the grand battle, rumored in the earliest days of filming at season seven’s answer to the Battle of the Bastards. Hellfire rains down on ships as Yara and Theon look on in horror. This seems to be part of the naval battle between her forces and Euron’s fleet that was once rumoured to be part of the land battle between Dany’s Dothraki forces and the Lannisters, but given that it takes place at night those two situations may be separate. This is also presumably where Yara is captured by Euron—in a montage of shots later on we see him fighting on one of these flame-strewn ships. Jon and his merry band surrounded by a horde of Wildlings. Note on the right you can see a flaming sword being swung, so that’s almost certainly Beric, confirming he’s joined with Jon for whatever’s going on beyond the Wall. 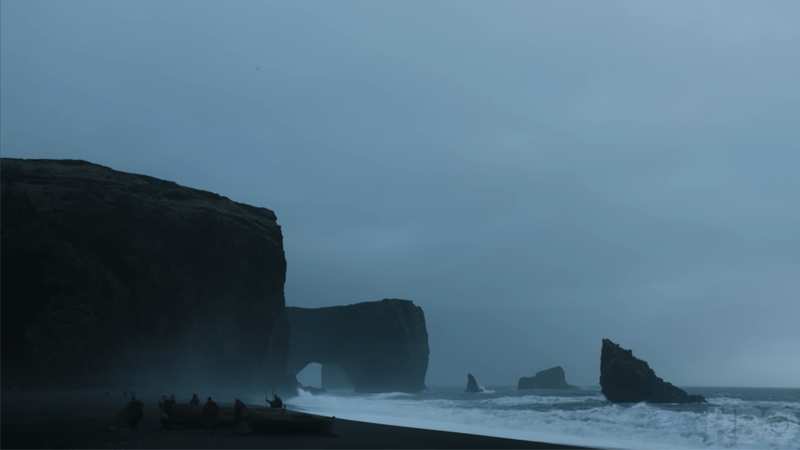 The next bit of the trailer goes by fast—shots of Missandei and Grey Worm kissing, Tyrion looking distraught, Jon and Davos landing at Dragonstone (once again, you can tell by the fancy rock formation! 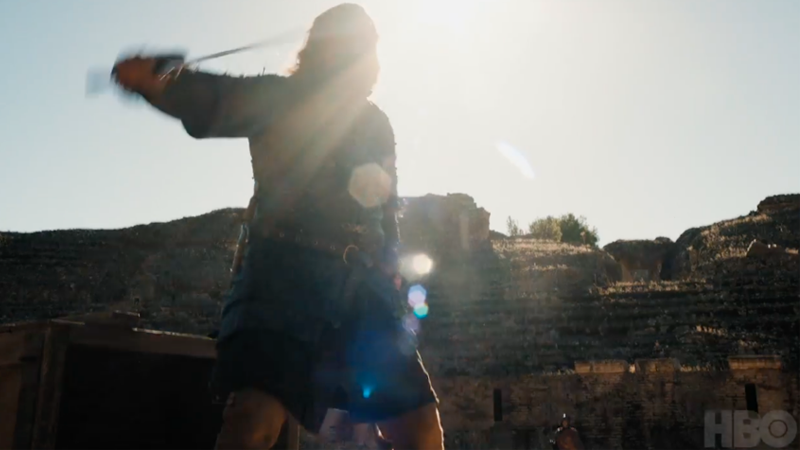 ), but most intriguingly of all is this sun-soaked shot of what looks like Sandor Clegane drawing a weapon. Strap yourselves in, because we have a pretty wild theory as to what this is and where it’s taking place. Judging by the environment you can make out—it’s definitely not the dreary Northern settings we’ve seen Sandor Clegane in the other shots of the trailers—this could be the Dragonpit, a set of ruins just outside King’s Landing that the Targaryens kept their dragons before they all died out. 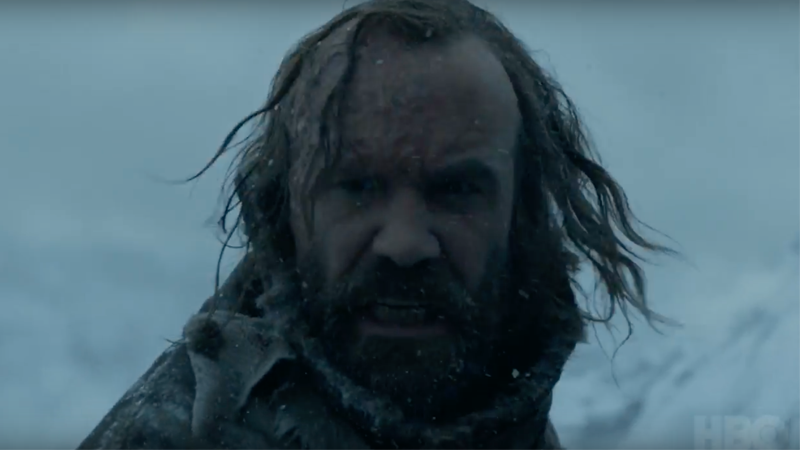 There has been a litany of reports that the Dragonpit will become a major location in season seven, and which are rumored to include climactic scenes that will see pretty much the entire primary cast of Game of Thrones together for the first time... including Sandor Clegane. If this is the Dragonpit, and Clegane is there, his evil brother-turned-zombie-guardsman Gregor will likely be there as well, presumably as part of Cersei’s retinue. This would be a pretty strong reason for a furious Sandor to draw a blade there. Could the long-awaited duel between the Clegane brothers (often referred to as the Cleganebowl) finally be happening at this crucial location? A dismayed, disheveled Theon collapses on the shores of Dragonstone, which we know thanks to set reports. 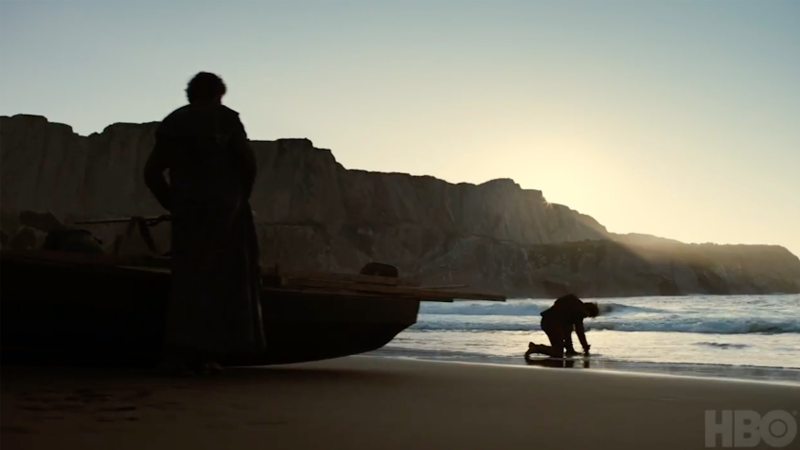 This is presumably after Yara is captured, but we also know Theon is on the beaches there for another scene where he finally reunites with Jon Snow after years apart... and the whole “betrayed Robb and helped split the Stark family up” thing, which leads to Jon angrily accosting the poor Greyjoy. Theon just can’t catch a break. 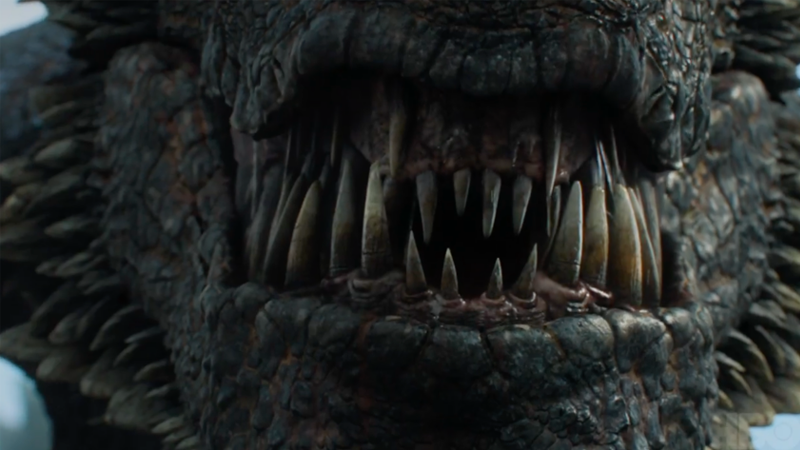 Oh my, Drogon, what lovely absolutely horrifying teeth you have. When the snows fall, and the white winds blow, the lone wolf dies... but the pack survives. Start speculating who the lone wolf is now! Anything else you noticed in this trailer? As always, tell us what you saw in the comments below. Game of Thrones finally returns July 16.